they do, just not a traditional round one i know because my driver has a bunch of voltage with no power source. Yep, right nest to the LD solder points. Since you're worried about the voltage across the laser diode, you can pretty much just always say it's a good idea to short the two points where the LD will be connected. I try to, no matter what driver I'm using, short out the 2 points where I'm going to be attaching the laser diode right before soldering it on. It can't hurt, and that way if there's any extra capacitance in the driver chip or in any capacitor int eh circuit, you can be sure the LD will be seeing zero potential when you connect it. Just always short to discharge at the place the laser diode will be attached. Just bridge the + and - Voltage connectors with a bit of wire, that usually does the job, just a warning though, if it's a big capacitor, such as the type found in some disposable cameras or in PSUs BE VERY CAREFUL WHEN BRIDGING THE CONNECTIONS, they can hold HUNDREDS of volts, so you can imagine the spark you get when you discharge that much power, just be careful. I have posted several times about incorpoating a bleeder resistor (~5mA) across the driver output. It provides open circuit regulation and discharges a 10 mFd cap quickly. Basic electronics. I do exactly that on my test load... 2kohm resistor across the output of the driver, drops about 1-3mA depending on the output voltage. I think I calculated 99.999% of charge dissipated in <1s after power removed on my driver (less if smaller capacitor, mine's 47uf). There are four ceramic SMD caps on the FlexDrive. Three are 0805 size and one is real tiny.. They are the beige or brown components. The three "big" ones are positioned like this: If you have the input on the left, there is one of the three left of the IC and two on the right of it, just above the pot. The rightmost is the output filter cap. 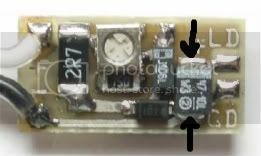 The tiny one is the component right under the IC. Oh yeah . . . . . and then you get to take the laser back apart and re-build it.